We strive to to enhance our clients' coastal lifestyle by offering a variety of design services ranging from full service interior home decoration to construction materials coordination. This is accomplished by a consultation at your home to discover your taste preferences. We then provide a written outline with all the details of the design to define the project's cost. This means we will locate and purchase furniture, fabrics and accessories at the designers cost, plus an agreed upon percentage on top to cover our time. With 25 years experience as an interior designer and having both renovated and built houses ourselves we are delighted to offer our services for complete home projects. From selecting door knobs to handling artwork and everything in between, I'm confident I can help you pull together all of your ideas and dreams to make your project your reality. Fee is determined on a project-by-project basis. 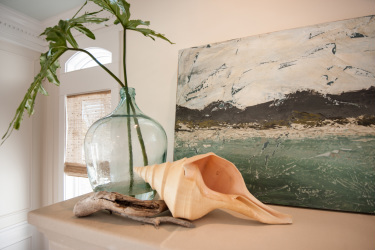 For further details on how we can help make your coastal home uniquely yours please contact us at www.siennasrb@aol.com or by telephone at (850) 585-9813.